Kilchoman Distillery has a high-tech method for showcasing its old-fashioned approach to whisky making. The Kilchoman Distillery is the first to be built on Islay Island in 124 years. Islay is the southernmost isle of the Inner Hebrides, a chain off the coast of western Scotland renowned for single-malt whisky. Kilchoman is also the only independent farm distillery on the isle. At the facility, 30 full-time workers manage the entire whisky production process, including harvesting the barley grown onsite, malting, selecting casks, distillation and bottling. The company’s whiskies have won several awards internationally. The industry is, however, fiercely competitive with 126 licensed Scotch whisky distilleries selling to some 200 markets internationally, which presented Kilchoman with a challenge – how to stand out from the crowd as one of the smallest companies in the market. The company was considering its options of how to best share its story with consumers. It mulled over putting leaflets in its cartons, using QR codes and considered changing its packaging when the printed electronics company Thinfilm reached out to suggest the firm experiment with near-field communication (NFC) labels on its bottles. “It seemed to us to just jump out with a pretty cost-effective but powerful option,” said Peter Wills, sales and marketing manager at Kilchoman. Kilchoman decided to replace conventional neck-tag booklets with versions featuring embedded NFC technology. The smart tags would enable consumers to tap the tags with their smartphones to get information on the whisky in their hands including tasting notes and distillery information. “In the whisky industry, there’s an emphasis on transparency,” Wills said. “People want to know exactly where the whisky came from, what’s in it and how old it is, and what kind of cask types were used to make it. 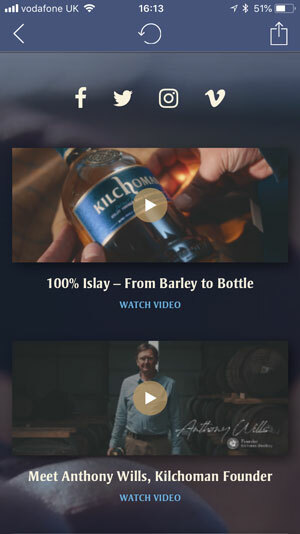 The NFC marketing campaign enables the company to provide consumers with an array of extra information it couldn’t include on the label, including detailed information on the production of its flagship Machir Bay and Sanaig whiskies and links to videos showing the company’s farm distillery in action. The campaign also improved the company’s geographic visibility into its supply chain. Also weighing in the decision to test NFC marketing was the fact that spirit consumption has risen in recent years relative to the sales of other alcoholic beverages, including an uptick in consumption among millennials, who are the top users of smartphones. Kilchoman was “interested in ways that they would be able to optimize connection with those particular younger demographic groups,” said Bill Cummings, Thinfilm’s senior vice president of corporate communications. In an early trial, the technology outperformed traditional digital marketing by a wide margin. With a tap rate of 6.5 percent, the NFC-based marketing campaign was 70 times more effective than display ads and three times more effective than email or search campaigns. The campaign tracked consumers across 13 countries in Europe enabling them to track open rates in popular whisky-drinking hubs across the continent. Wills said many spirit customers already do research on their smartphones when attempting to select a bottle. The NFC-based mobile marketing platform “cut out the middle part of having to go search online. It gives them the information they are searching for in the easiest way possible,” he said. “And also, some of the big companies cut a few corners with what they are putting in the whisky and how they are making it. We’re doing it the old-fashioned way — all by hand.” A screen capture of the app is shown at right. At first, Kilchoman wasn’t certain what the engagement rate with the NFC marketing campaign would be. “As soon as the connected bottles got out there, it seemed people wanted to tap and wanted to find out more information,” Wills said. The NFC program also spurred Kilchoman to refine its overall marketing strategy, helping it fine-tune its social media strategy. The company is also developing new NFC portals on its website. “We’re trying to get our whole online presence really linked up together and improving out as much as we can,” Wills said. The company ultimately plans to replace the neck-tags by embedding the technology directly into the primary labeling on the bottles of its flagship whiskies. So, What Are We Calling Narrowband-IoT Today? The idea is simple: a version of LTE that doesn't use much power for IoT applications. But naming it is hard – rilly, rilly hard!